New Jersey policeman reportedly kills wife, witnesses say officers made no effort to stop second round of shots. 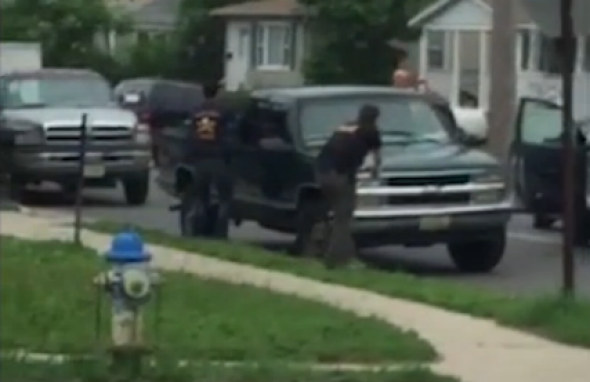 A still from a video taken by a witness to Wednesday’s incident in Asbury Park, New Jersey. Philip Seidle’s head is visible above the pickup truck at the center of the frame. At around 11:30 a.m., Asbury Park police officers … saw a 2012 black Volkswagen Jetta being driven by Tamara Seidle turn onto Sewall Avenue. Behind it, LeMieux said, was Phillip Seidle in a 2005 Honda Pilot. The couple’s 7-year-old daughter was in Phillip Seidle’s passenger seat, he said. Tamara Seidle crashed her Jetta into an unoccupied green Ford Focus, LeMieux said. At that time, LeMieux said, Phillip Seidle got out of his car, took out his .40- caliber Glock service handgun and fired “several” shots into Tamara’s Seidle’s car. Tamara Seidle suffered multiple gunshot wounds and died. Citing a witness, NJ.com reports that other officers “hugged [Phillip Seidle] and patted him comfortingly on the back” when he was eventually taken into custody at the scene.